These delicious ricotta toasts, flavored with vanilla bean, honey, and rosemary are the perfect brunch or lunch offering. 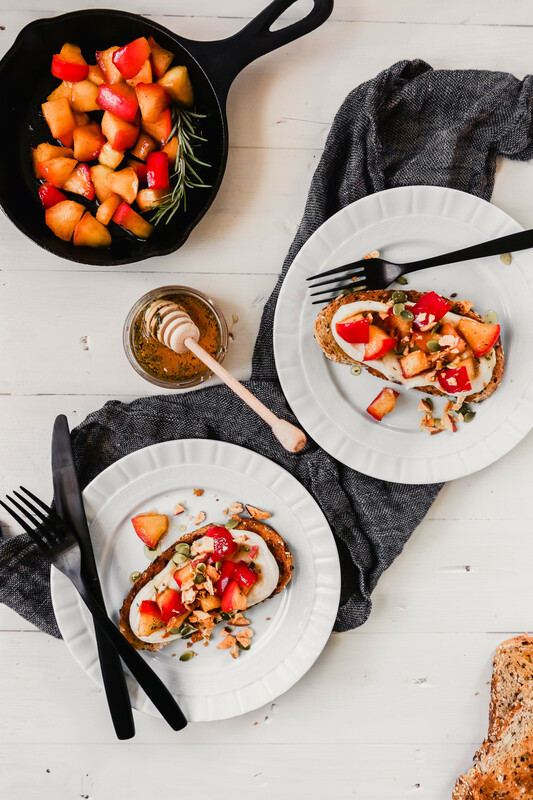 Topped off with spiced sautéed apples and a creative gremolata, these toasts are not only packed with flavor, but textures too. Comprised of a few different components, this seemingly complex recipes is actually quite simple when you get down to it. To kick things off, honey and fresh rosemary are combined and heated to create an herbaceous drizzle for the toasts. Ricotta is enhanced with vanilla bean paste and a touch of the herbed honey. Then it’s on to a quick, creative gremolata comprised of just 3 ingredients—dried apple chips, pepitas and lemon zest. Finally, diced apples sauté briefly with some honey and spices while hearty whole grain bread toasts to perfection. All that’s left is to assemble and enjoy! So, ricotta toast…what kind of toppings can you use? In the same vein as avocado toast, ricotta toast can be topped with a) whatever you like and b) more realistically, whatever you have on hand. However, unlike avocado toast, ricotta toast can go a sweet or savory direction. Honey pairs incredibly well with ricotta, so you’ll often see honey drizzled over both sweet and savory varieties. 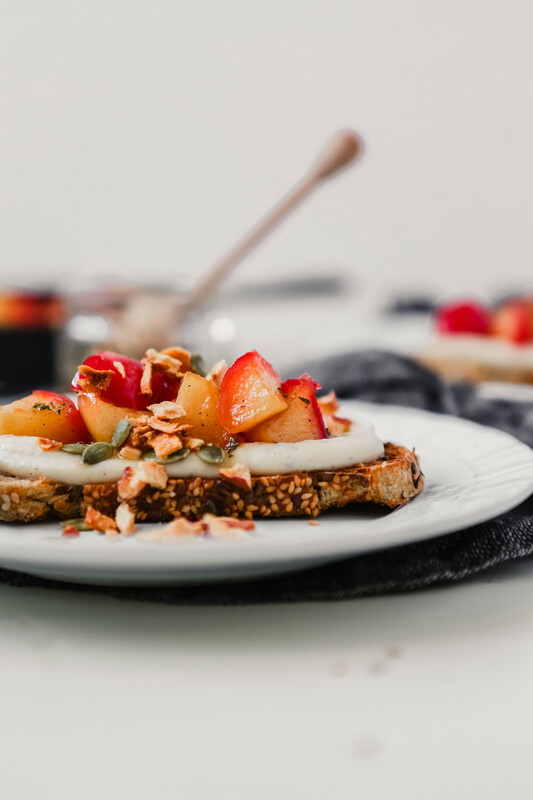 Just about any kind of fruit lends itself to ricotta toast as well, everything from caramelized bananas and pears, to mixed citrus or fresh berries with mint. For as many sweet variations as there are, there’s just as many savory. Try roasted cherry tomatoes, arugula and asparagus for a spring-inspired toast. Or top your creamy, cheesy toast with sautéed garlicky greens and a couple of poached eggs for a hearty start to your day. You get it, it’s like a blank slate. It depends on a few things. But in general, if made mindfully, ricotta toast can be healthy. The kind of ricotta matters. I use low-fat ricotta as opposed to full-fat or skim. I prefer low-fat because it’s lighter than full-fat while still being more flavorful and less grainy than skim. So, if you’re looking to make ricotta toast healthier, opt of light ricotta. Aren’t watching your fat intake? Full-fat will be the most creamy and flavorful. Take stock in the bread you use. 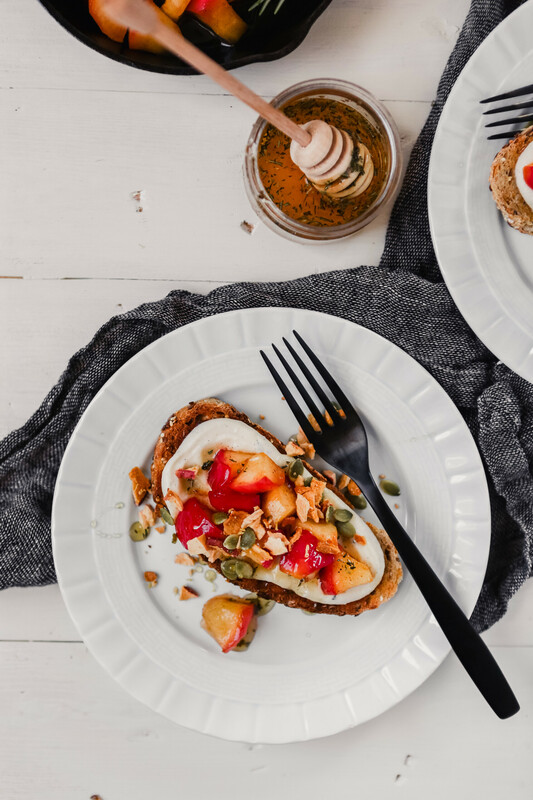 If you’re looking for a healthier ricotta toast, opt for a hearty, seedy, whole-grain bread as opposed to a white bread variety. Whole-grain bread will add fiber and protein to your meal white white bread will strictly offer carbs and sugar. Fresh berries and fruit are always a healthy option. Likewise, fresh arugula, herbs and a few poached eggs would make a great wholesome breakfast or lunch. On the other hand, caramelized bananas and chocolate shavings would be deliciously decadent, but not the healthiest of options. Classically, gremolata is a garnish made of parsley, lemon zest and garlic. It’s often sprinkled over hearty meat dishes, such as osso buco, to add freshness and texture. Restaurants will often top dishes with a gremolata of their own, using a variety of different herbs, or even adding breadcrumbs to it. 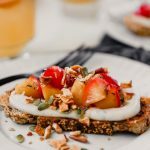 For this recipe, I developed a unique take on the classic garnish using crunchy baked apple chips, pepitas and lemon zest as a way to add crunch, flavor and freshness. 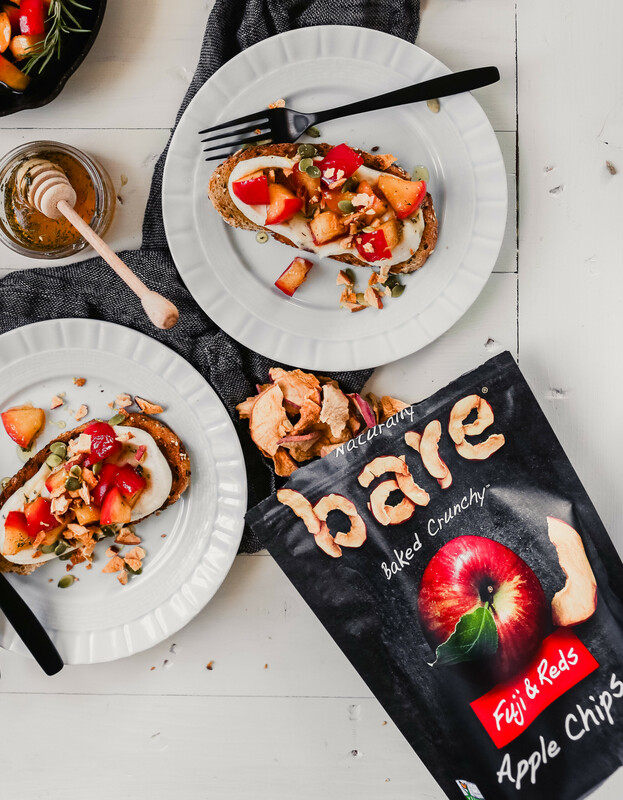 Bare Snacks by far makes some of the best apple chips on the market. And with no added sugar, they’re a wonderful on-the-go snack. But for this recipe, they’re the piece that elevates this dish to elegance. What do you serve with ricotta toast? 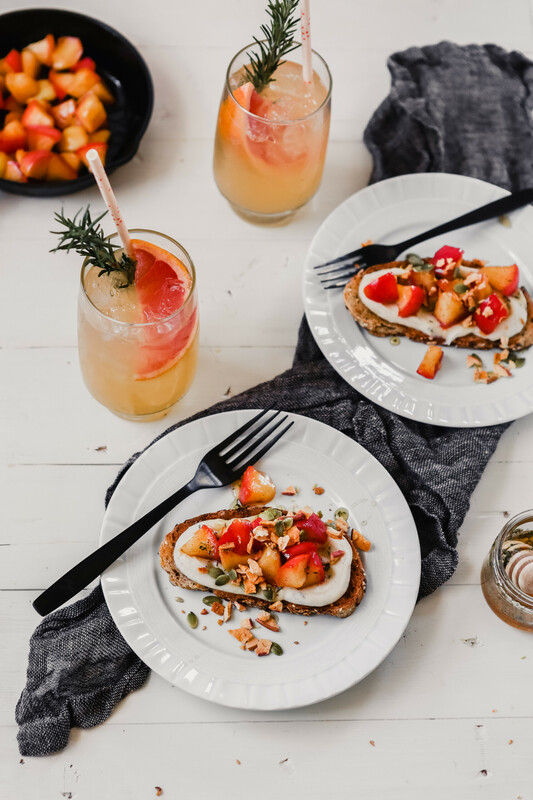 This ricotta toast with sautéed apples was developed to be featured alongside my refreshing Grapefruit Rosemary Soda. You can check out the complete menu description, or grab the recipe for the soda! This toast also goes well with some scrambled eggs, a fresh arugula salad and/or a piping hot cup of coffee. Bring honey and rosemary to a simmer in a small saucepan over medium heat; remove from heat and let cool. Combine apple chips, pepitas and lemon zest; set aside. Heat oil over medium in a nonstick skillet. Add apples and honey, and sauté until just starting to soften, 6 minutes. Add cinnamon and nutmeg and cook until fragrant and apples are soft, 1–2 minutes. Off heat, stir in lemon juice. Combine ricotta, vanilla bean paste and 1 tablespoons of the prepared rosemary honey. 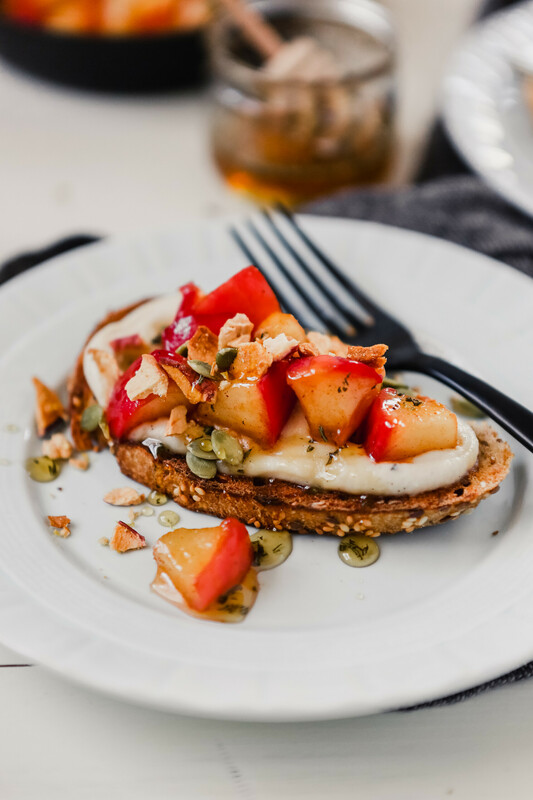 Spread a few tablespoons of ricotta onto each piece of toasted bread then divide apple mixture between toasts. Drizzle with warm rosemary honey and sprinkle with gremolata and sea salt; serve. 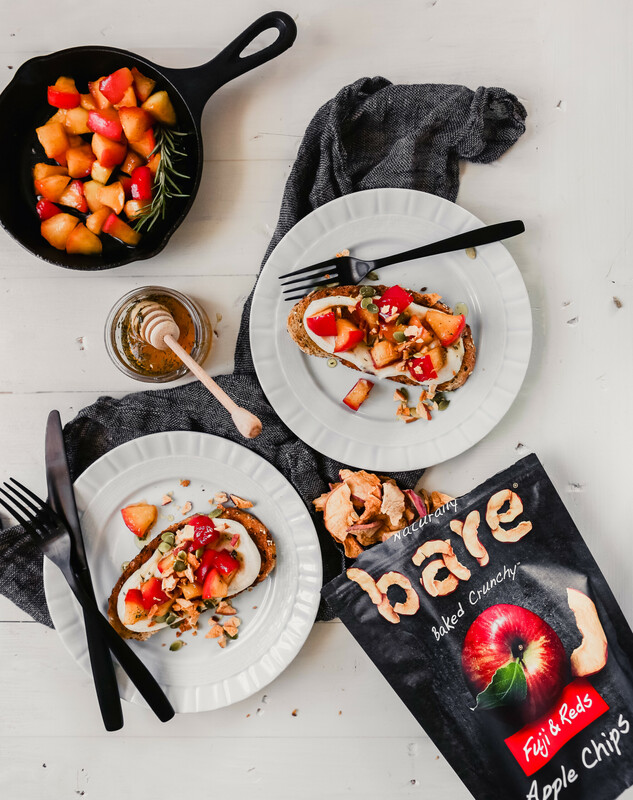 So creative, I love Bare snacks! !